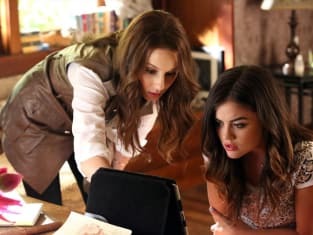 Lt. Tanner presses Alison to identify Cyrus as her kidnapper before his 48 hour hold is up in Pretty Little Liars Season 5 Episode 10. Alison is hesitant to say anything, and her friends worry she will put an innocent man's freedom in jeopardy. Spencer believes that Alison will soon turn on her friends and tries to convince her friends to tell Tanner the truth. But she has much bigger problems when the recording Alison made at the doctor's office disappears. Her surveillance footage shows Melissa handing something to a mysterious man in the night. Melissa won't admit to anything, but warns Spencer that it's dangerous to be around Alison. Alison tells Emily that recognizes Cyrus. The two stayed in abandoned basement together until he stole her things and slashed at her thigh leaving the scar on her leg. After Alison is taken to the basement where she and Cyrus stayed together, she has a flashback of their violent confrontation and says she remembers the location. Tanner calls in to the station to hold Cyrus, but he leaves before they get the call. Watch Pretty Little Liars online to see who sent Cyrus to the police.